High-performance task chair offers large seat and back cushions for support. 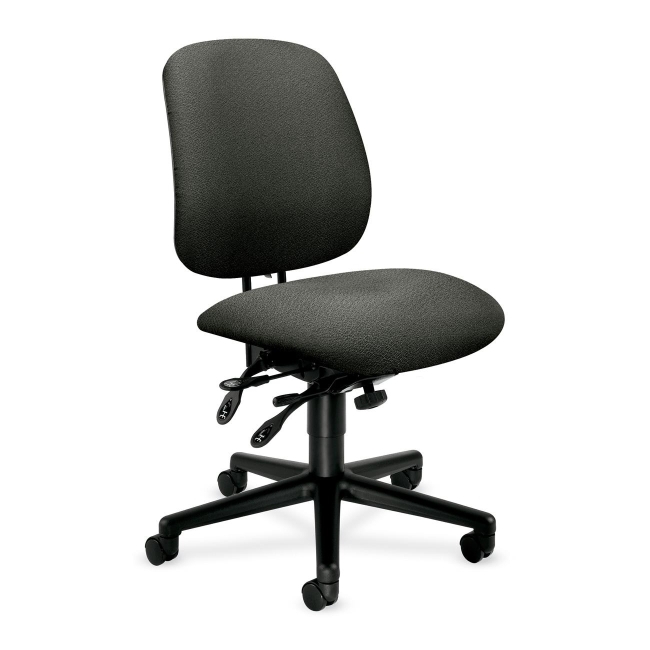 Functions include easy back-height adjustment, pneumatic seat-height adjustment, 360-degree swivel, tilt tension, seat-glide mechanism, tilt, tilt tension and asynchronous control. 20" wide seat offers a usable depth of 15" to 20". Back measures 18" wide x 18-1/2" high. Five-star base is made of 16-gauge formed steel with a plastic base cap and has 2" hooded dual-wheel casters. Arms (height and width adjustable) for chairs are sold separately. Task chair meets or exceeds applicable ANSI/BIFMA standards. Certified by SCS to be in compliance with specific indoor air quality emission requirements. Chair is available in black frame only.